D23’s “Destination D: Celebrating Mickey” event was held this weekend with a ton of news. There was also some news released outside that event, and we’re covering that here too. Here’s a rundown, with some commentary, about the biggest things we learned. Star Wars: Galaxy’s Edge, the new land coming to Disneyland and Disney’s Hollywood Studios in 2019, had a few announcements. Quick side note: the above photo is concept art featured on Disney Parks Blog. While attractions and the immersive nature of the land always get a lot of hype, we’re always blown away by how complex this land looks. This rustic work is reminiscent Pandora—The World of Avatar, which is reclaimed RDA territory, but without the massive amount of nature to pretty the place up. Anyways, onto the announcements! The two new rides in Star Wars: Galaxy’s Edge will be Millennium Falcon: Smugglers Run and Star Wars: Rise of the Resistance. The lack of an apostrophe in “Smugglers Run” is a little strange, but the name still makes sense. From past descriptions, we know Millennium Falcon: Smugglers Run will put riders in one of three positions aboard the Millennium Falcon. Akin to Epcot’s Mission: SPACE, each rider will have a set of tasks to complete. Unlike Mission: SPACE, these tasks will actually impact the ride. Not only that, your team’s performance is expected to impact your experience throughout Galaxy’s Edge. The idea being, for example, that you might head over to the cantina and catch some ribbing from the staff if the mission didn’t go so well. Star Wars: Rise of the Resistance is set during a battle between the First Order and the Resistance. In your eight-person First Order Fleet Transport, you’ll navigate your way through the battle. This sounds a little like a cross between DINOSAUR / Indiana Jones Adventure and Star Tours to us, but if you have a clearer vision, let us know! This was long rumored, but John Williams will score the background music (or at least some of it) at Star Wars: Galaxy’s Edge. More concept art was release for the Star Wars Hotel coming to Walt Disney World. As expected, this is setting up to be the best hotel on Disney property by a wide margin (though obviously you’ll have to “put up” with the heavy theming). Honestly, the slow drip of Star Wars: Galaxy’s Edge news is getting a bit tedious. It makes sense that Disney wants to build hype, but at this point the amount of critical unknowns is far outweighing the minor updates we’re getting. We still don’t know the date the lands will open in Florida or California, with the best estimates currently being summer 2019 for Disneyland and late fall 2019 for Disney’s Hollywood Studios. We also don’t know much about the hotel, including when it’s expected to open, what its size will be, or what its cost will be. One rumor suggests it could be as small as 68 rooms, which would easily put the price in the $2000 to $5000 range, in which case Disney is being kinda jerky to the 99% hyping it up at every turn. On a minor note, we don’t know what FastPass+ will look like at Hollywood Studios at the end of 2019, when it will have the three most popular rides at Walt Disney World. It’s great to have some new concept art to look at, but that’s sort of meaningless. I don’t really care what the art looks like, I care what the land will look like. And to see the land, I need to plan my trip. And to plan my trip, I need exactly the details Disney is refusing to give me. Hollywood Studios continues to be the short-term focal point of activity in Florida, and it’s got two more offerings coming in 2019. Imagineers have been hard at work creating Mickey & Minnie’s Runaway Railway at Disney’s Hollywood Studios, using breakthrough technology to transform a two-dimensional cartoon into an amazing real-world experience. The first-ever ride-through attraction themed to Mickey Mouse will feature a new original story and lovable theme song as it takes guests on a journey inside the wacky and unpredictable world of Disney Channel’s Emmy Award-winning “Mickey Mouse” cartoon shorts. While a lot about this screams “screens,” I’m optimistic. Unlike the Ratatouille ride coming to Epcot (more below), this will actually be an original attraction. There’s always the question of the campy design (evidenced in the above logo), but there’s really no timeless way to design an animated ride. I trust that Disney will be putting the real effort into making Mickey Mouse’s first ride a true gem, so I’m quite excited about Fall 2019! May 2019 will being a new projection show to Hollywood Studios. Titled “Wonderful World of Animation,” the show is expected to replace Disney Movie Magic as the secondary night time show at Hollywood Studios. Not much to say here. Hollywood Studios has the worst of the projection shows, Sunset Seasons Greetings during Hollywood Studios Christmas (Flurry of Fun) being a notable exception. Generally, I just expect a bunch of clips of Disney films to play on the Chinese Theater, and the above concept art doesn’t really dispel that. Disney revealed the vehicles that will be used for the Guardians of the Galaxy coaster coming to Epcot (targeted for 2021). Basically, the vehicles are a sort of hybrid dark ride / coaster vehicle where your coaster car can move to point you in different directions. I imagine this will be cool, I worry it will be nauseating. I’m reminded of how I feel during one of those rides over in Universal’s Wizarding World of Harry Potter (with a very different ride system). Part of the reason coasters usually point people forward is because people are naturally conditioned to move forward. But hey, a little nausea is worth it, and the chance to keep you from seeing the track in front of you on a coaster is a pretty good idea. Also in the release: the Guardians of the Galaxy building is big enough to fit FOUR Spaceship Earths. That’s pretty cool, until you consider that the park will now have a giant box four times the size of its icon in the skyline. But hey, the above rendering is pretty beautiful, so maybe it’ll be alright. The Ratatouille ride coming to Epcot’s France Pavilion will be named Remy’s Ratatouille Adventure. 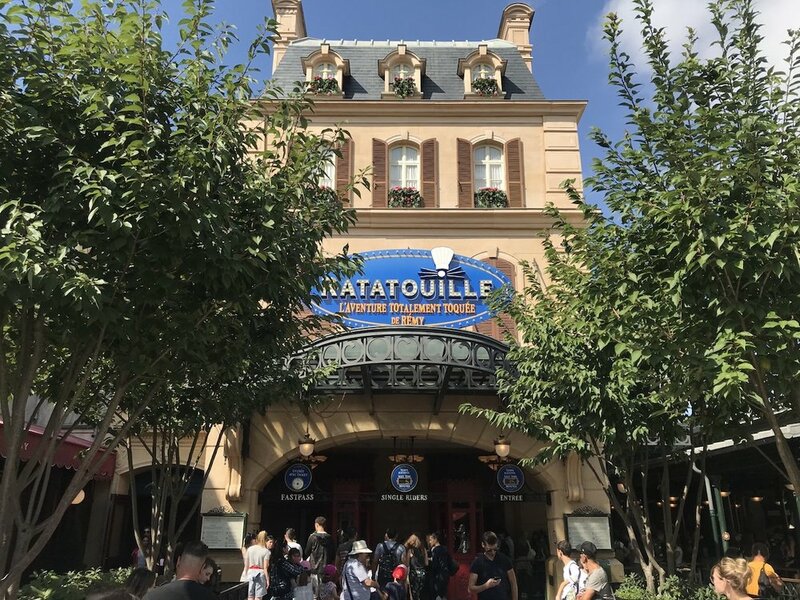 Remy’s Ratatouille Adventure is targeted for a 2021 opening, though the some rumors suggest Disney is ahead of this date. This isn’t surprising, given that the ride is expected to be mostly a clone of the Walt Disney Studios Park (Paris) attraction Ratatouille: The Adventure. Overall, we aren’t excited about this. It continues a movement away from cultured attractions in the Epcot pavilions and toward tangentially-related IP-based attractions. If they wanted to bring some of Walt Disney Studios Park to Epcot, they could replace The Seas With Nemo and Friends with Crush’s Coaster. Ratatouille: The Adventure is a simple trackless dark ride that relies on screens to create effect. It has some really cool, small touches, but it’s simply not a world class attraction. Disney doesn’t have to reinvent ride experiences for every ride, but this seems like it will be more filling space in Epcot than adding real value. The France Pavilion will also be getting a new Beauty and the Beast Sing-Along attraction. The release date of this is unclear, but it sounds like it could be as early as 2019. We’re torn on this one. On the one hand, the Frozen sing-along in Hollywood Studios is an underrated experience. On the other, we have Beauty and the Beast fatigue, having recently sat through the Disney Cruise Line production of the show. All that said, it’s good to see Disney finding space for the classics in its current attraction lineup. Also, we’re not huge fans of the France pavilion as it’s currently constituted, and (based on the concept art) the expansion does look like it will bring new life to the space. [“Epcot Forever”] will feature classic Epcot tunes. “Epcot Forever” will begin with a spark of imagination that swells into an epic spectacle of fireworks, music, lighting, lasers, and special effects kites. The concept art (above) for this one isn’t particularly revealing. Epcot is expected to undergo a huge refurbishment over the next decade. It’s safe to say that these announcements are only the tip of the iceberg. We didn’t even mention that “O, Canada” is also getting redone. Rumors of a new World Showcase pavilion continue to swirl. Spaceship Earth is expected to undergo a length refurbishment in a few years. And if you were making a list of attractions and spaces in Walt Disney World that it makes business sense to update…well 15 of the first 20 would probably be in Epcot. As part of the big push to celebrate Mickey, Magic Kingdom will have Mickey and Minnie’s Surprise Celebration going on from January 18 through September 30, 2019. This celebration will feature food, entertainment, and merchandise. Disney released the above photo of Mickey and Minnie in their celebration gear. It’s a little silly to draw conclusions about an entire event from two outfits, but this picture definitely has us excited. The colors are just so vibrant, it looks like it will really bring life to the park. In addition to the Star Wars Hotel concept art, we got some other news about two upcoming Disney World hotels. This proposed 15th Disney Vacation Club property, projected to open Fall 2019, is inspired by the European grandeur Walt Disney experienced in his travels along Europe’s Mediterranean coastline. As you can see from this newly released rendering, Disney Vacation Club Members and other guests will have a great view of fireworks spectaculars and easy access to the Disney Skyliner, which will have a station at the resort. As the above concept art shows, some guests will have a good view of Epcot’s fireworks. You can also see the Skyliner heading over from Hollywood Studios (that’s Tower of Terror shining in the distance). Disney also announced the name of its new deluxe resort “Reflections: A Disney Lakeside Lodge.” The name is a bit pretentious for our taste, but Disney’s “lodge”-style properties are its best. Then again, do we need another one? I’m sort of interested to see how we differentiate Wilderness Lodge, Animal Kingdom Lodge, and Reflections Lodge at the end of the day. Explorers Lodge in Hong Kong Disneyland took a unique approach to differentiating itself, focusing more on explorers and travel than nature. Reflections is expected to focus on nature, which is sort of what Wilderness Lodge and Animal Kingdom Lodge already do. Regardless, with a projected size of 900 rooms, we obviously have a few years before we’ll get to see Reflections (get it?). Still not clear what the window situation will be on these bad boys. But I don’t know, transportation really just needs to get you from point A to point B, the rest is just bonus. 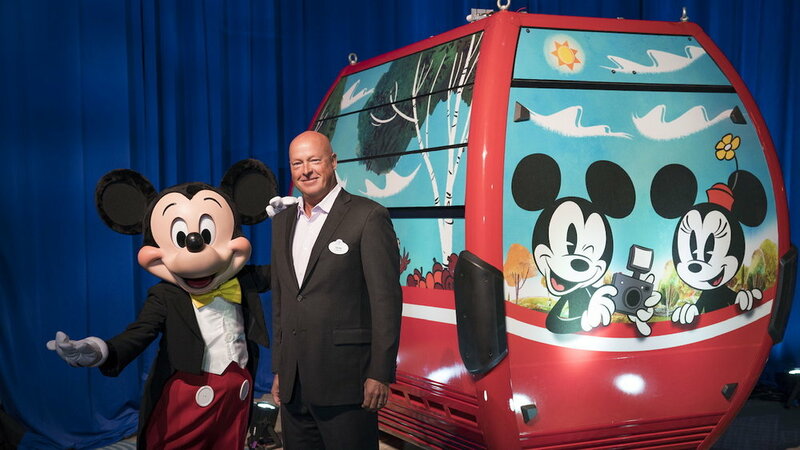 The Disney Skyliner is targeted to being operation in…you guessed it…Fall 2019. Well, that’s it for all the recent news. It’s a bit wild how much is getting updated at Walt Disney World these days! Don't be overwhelmed by Disney World planning! Take a second to check out our most important content and you'll not only be an expert, but you'll save big $$$ along the way. Just starting out? Check out our Walt Disney World planning guide! If you're still picking dates, we've got everything you need to know about Disney crowd calendars. For picking your hotel, check out our Walt Disney World hotels guide. When it comes time to book, we've got you covered with posts on how to book cheap flights, how to get the best deal on your Disney hotel, and where to find discount Disney World tickets. And of course everyone wants to know whether or not they should get a Disney World dining plan! Don't forget to master your Disney World FastPass+ strategy a few months in advance. We'll keep you out of long lines so you can maximize the magical time in the parks! We've got park-specific guides as well: Magic Kingdom FastPass, Epcot FastPass, Animal Kingdom FastPass, and Hollywood Studios FastPass. Know what to ride with our guides to: Magic Kingdom rides, Hollywood Studios rides, Epcot rides, and Animal Kingdom rides! Plus learn about the water parks with our guide to Blizzard Beach and our guide to Typhoon Lagoon! Finally, before you head out, be sure to check out our to-the-point packing list, 10 essentials you forget to pack for every Disney trip. And if you're interested in saving, there's no better list than our 53 Ways to Save on your Disney trip from start to finish. New Galaxy's Edge Reservation Details! This site is in no way affiliated with Disney or its subsidiaries. The opinions expressed here are those of the author. We are not financial or legal experts or advisors, and the contents of this site should not be considered as or a substitute for financial advice.